The "Castore", at 4,226 metres in altitude, is a favorite destination for climbers who come and stay at the refuge. Higher than the “Polluce,” it forms the Gemelli massif, a slope which is not technically difficult. 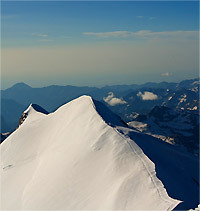 There are enjoyable small ridges to cross in order to reach the summit and the view from the top is magnificent. It is possible to enjoy views of the Breithorn, the Matterhorn, the Grand Combin the Mont Blanc and Grand Paradiso massif, the Lyskamm Occidentale and Orientale, the main peaks of Monte Rosa and the Punta Dufour and Nordend, Punta Gnifetti, Punta Parrot and the Pyramide Vincent. To the north the view opens up to the Vallese mountains of Switzerland, and to the south you can see the Monviso. The path winds along the Felik Glacier in a northern direction towards Punta Perazzi; it leads through this section, minding the crevasses, and then goes to the right at the Colle del Felik. The path then winds up steep switchbacks that quickly lead to the Felik pass. After the path begins its ascent to Felik’s peak, it leads onto a ridge with some enjoyable ups and downs to finally arrive at Castore’s summit. The descent follows the same route as the ascent.